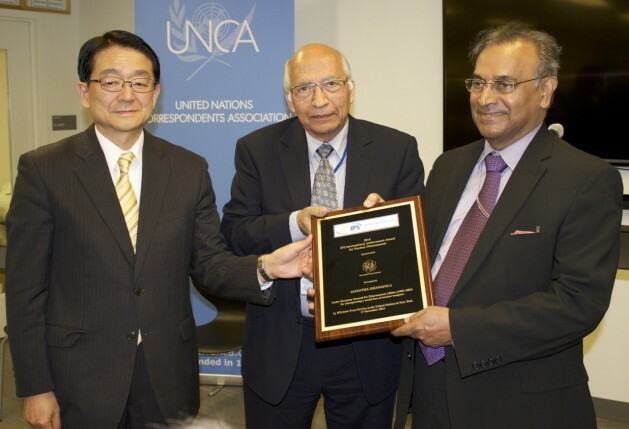 UNITED NATIONS (IPS) - Jayantha Dhanapala was awarded the IPS International Achievement Award for Nuclear Disarmament on Nov. 17 at the United Nations in New York. Kutesa’s sentiments were echoed by other speakers including Dr Lassina Zerbo, executive secretary of the Preparatory Commission for the Comprehensive Nuclear-Test-Ban Treaty Organisation (CTBTO). Zerbo noted that Dhanapala was born in the same month (December 1938) that German scientists Otto Hahn and Fritz Strassmann discovered nuclear fission. The result of this work was that the CTBT, which was being contested in Geneva, was adopted by the General Assembly in 1996. Dhanapala continues to support the CTBTO, as part of a group of experts who work to advance the CTBT’s entry into force. Zerbo recalled Dhanapala’s criticism of India’s position in opposing the CTBT. India’s criticism of the CTBT has been that it will not move disarmament sufficiently forward. In response to this, Dhanapala has said, “Opposing the CTBT because it fails to deliver complete disarmament is tantamount to opposing speed limits on roads because they fail to prevent accidents completely,” Dhanapala has pointed out. Collectively known as the “Annex 2” states, India forms part of a group of eight countries that are required to ratify before the treaty before it can enter into force. India, Pakistan and North Korea have yet to sign the treaty, while 5 other states have signed but failed to ratify. Zerbo also noted the relevance of Dhanapala’s nationality in his advocacy for disarmament and non-proliferation, saying, “Jayantha and I both come from countries in the developing world. IPS Director General Ramesh Jaura, who read a statement from IPS founder Roberto Savio, spoke of the origins and importance of the award. “The award was created in 1985 with the idea to provide a link between the action of the U.N. at global level, and actors who would embody that action,” he said. “The U.N. way is not to recognise individuals, so the award is a recognition of the bridge between ideals and practice." The award has been resurrected after a six-year hiatus, and will be in place next year again. Additional awards in 2016 and 2017 will focus on the Sustainable Development Goals. There are several opportunities in the coming months for inroads to be made in nuclear non-proliferation and disarmament. Notably, early next month’s Vienna Conference on the humanitarian impact of nuclear weapons.